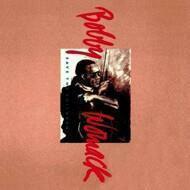 Womack's '60s soul-based sound while reflecting the influences of late-'80s hip-hop and pop. Highlights include the snappy "Baby I'm Back," "She's My Girl," and the torchy duet "Now We're Together," but it's on "Too Close For Comfort," a ballad co-written with H.T. Payne, that Womack comes closest to rekindling the kind of sound found on some of the best-known tracks. The title track (not to be confused with similarly named songs by Marvin Gaye and the Intruders) managed to chart R&B in late 1989.